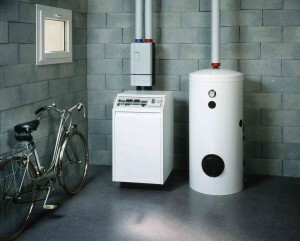 Hard water can lead to scale buildup in your water heater. If your home has hard water, the minerals that it brings into your home can cause big problems for the appliances throughout your home. Hard water can lead to scale buildup in your hot water heater and lead to a replacement much sooner than typically needed. How can you prevent scale buildup in your water heating element? First Things First, What is Scale Buildup? Scale buildup consists of the minerals in your hard water and is typically composed of a mixture of calcium and magnesium. Scale buildup looks like tiny white particles or even pieces of paper in your water heater, and it can be hard or impossible to get rid of once it’s there. Flushing your water heating element can help to remove all of the mineral particles floating in the tank. Most homeowners with hard water have this done twice a year. Start by turning off the electricity or gas connected to your water heating element and close the cold water supply. If you want the water to drain quickly, turn on a sink or even a bath close to where your water heater is. Check the bottom for the tank draining valve, connect a hose to it, and let it drain. The water that initially comes out might be very hot, so use safety precautions or ask a professional at Master Plumbing to do the job. Just like you use vinegar in your kitchen to naturally clean it, you can use vinegar to prevent scale buildup in your water heating element. After you drain the tank, close the valve and pour a gallon of cider vinegar into the tank. Let the vinegar soak for at least 6 hours and reopen the valve. Lastly, let water flow through to get all of the vinegar out. Once you are all done, close the valve and reconnect the gas or electricity. Give Master Plumbing a call at (301) 650-9100 or contact us online to get more information on how our expert plumbers can help you with your scale buildup (or just about anything else plumbing related!). We have received Angie’s List Super Service Award recognition for plumbing and drain cleaning every year since 2007, in addition to the Best Plumber award from Best of Bethesda. We are fully licensed, bonded, and insured and our service is unparalleled. Give us a call today—you won’t regret it! To see examples of our projects, follow us on Facebook, Twitter, and Pinterest. This entry was posted on Friday, January 13th, 2017 at 4:22 pm. Both comments and pings are currently closed.